The debut of the new Black Widow series makes a great case as to why the Hulk would fall in love with Natasha Romanoff. She wrecks a crap-ton of puny humans in a first issue that’s essentially one long action piece. There are two reasons Black Widow #1 is worth paying attention to. The first is the character’s high public profile. Up until last summer, she was the sole female hero in the cinematic version of the Avengers. With multiple big-screen appearances under her belt and mainstay status on various Avengers-themed cartoons, more people know about the Black Widow today than at any point in her publishing history. It’s quite simply a smart business decision to have her headlining a new solo series. The talent behind the new Black Widow book is the other reason it’s worthy of notice. Black Widow is being put together by creative partners Mark Waid and Chris Samnee, who ended a superlative run on Daredevil last year. The writer and artist are joined by Matthew Wilson and Joe Caramagna for the first issue, which starts off with a major status quo change for the Widow. After the first page shown above, Black Widow #1 spools out as an extended chase sequence, with Natasha on the run from operative who work for the agency she once belonged too. The pages are largely free of dialogue which shows off Samnee’s masterful control of pacing and framing. There’s a subtle cycle of escalation and explosion in Black Widow #1. Natasha’s first moments of action are low-key and up close. The hand twisted behind the back, the shove out of the way, the punch to the solar plexus... they’re almost intimate, with a close physical proximity that serves as a metaphor for the severing of bonds that’s taking place. Natasha doesn’t say a word until this issue’s last page but that doesn’t mean you don’t learn anything about her. Samnee and Waid pepper her tense evasion of SHIELD with moments that show her planning and improvising in coolly calculated fashion. She coyly lures one pursuer in close to use him as a prop to further her escape, an instance that subversively nods at the character’s history as an eye-candy token heroine in Marvel’s superhero boys club. As the issue goes on, the heroine engages in high-speed motorcycle choreography and brutal fisticuffs to end the pursuit. When Waid began his run on Daredevil years ago, he made a point of breaking away from the bleak, self-destructive undercurrent that had characterized Matt Murdock for so long. This series debut follows suit and offers the same kind of explosive break with the past. Black Widow #1 is the perfect comic for readers who might only know the character from the Avengers movies. It requires no prior knowledge of the character’s decades-long publishing history and efficiently transmits the pertinent info necessary to enjoy its pages: she’s a superspy who used to work for SHIELD; now she doesn’t. We get a sense of the range of her capabilities and can intuit that the stakes for her defection are very high. 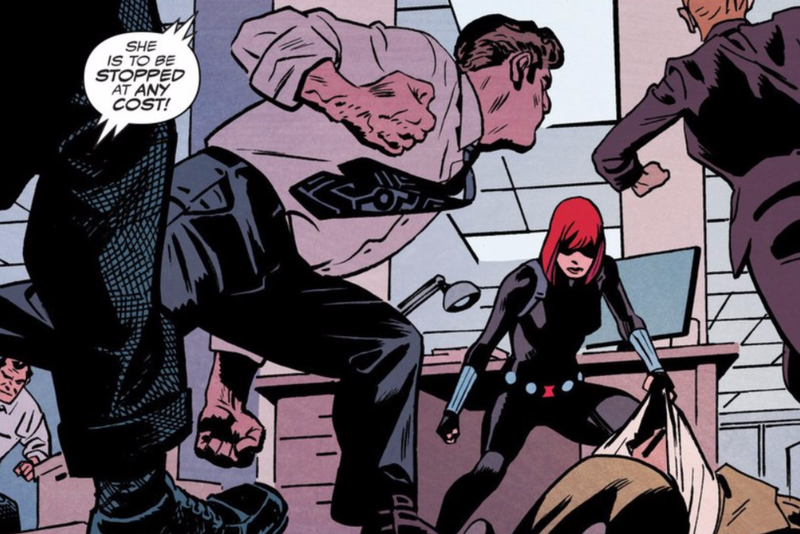 Natasha Romanoff now harbors a secret that’s worth changing everything in her life. It’s almost a certainty that she’s going to become a much more interesting character over the next few months.